Jeannie is a barefoot shiatsu teacher and practitioner, biodynamic cranial sacral practitioner, musician, mime, and music teacher. She has practiced yoga since 1972 and chi gung since 1990. In 2006 she established Pine Heaven Farm in the hills of Oakland. All of these practices contributed to her understanding of and curiosity about how energy moves us and our connection with Earth energies. Jeannie began her study of Core Individuation and the Sacred Anatomy with Desda Zuckerman. By the end of 2014 she was certified as a Practitioner and by 2017 a teacher of this work. She was lead to develop Sacred Anatomy Chi Gung, and has been teaching it for the past two years. 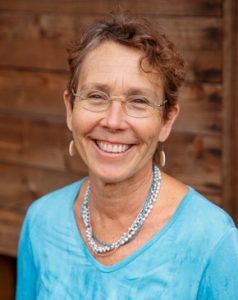 Jeannie enjoys guiding people in a process of exploring and creating deeper partnership with their own Sacred Anatomy, and is delighted to be expanding this to exploring the partnership of our Sacred Anatomy with the plant world.